Romaine lettuce, mozzarella cheese, tomatoes, basil and balsamic dressing. Steak tips marinated in our Honey BBQ sauce. Grilled Chicken with a sweet and spicy glaze. Chicken fingers tossed in our buffalo sauce. Chicken fingers tossed in our buffalo zone sauce. Hot ham, genoa salami, mortadella, provolone. Roasted turkey, ham, roast beef, American cheese. Crisp romaine, seasoned croutons, shaved Parmesan cheese and creamy Caesar dressing. Iceberg lettuce, tomatoes, cucumbers, carrots and Kalamata olives. Perfect blend of Soy sauce with a hint of sweet & salty. Homemade blue cheese & buffalo sauce mixture. Just the right amount of spice to heat up the wings. Sweet blend of honey & BBQ. Make it a Value Meal! Grilled chicken with fresh mozzarella and basil, tomatoes & balsamic dressing. Tender pork served on a toasted roll with coleslaw and a tangy BBQ sauce. Strips of beef with fresh tomatoes, lettuce, feta, red onions, and house sauce in pita bread. Grilled lean pastrami, salami, sauteed peppers, mushrooms, and onions on a grilled sub roll. Topped with melted American cheese. A classic-crispy bacon, lettuce, and tomatoes on a grilled sub roll. Mayo available upon request. Ground sirloin patty grilled to perfection. Topped with American cheese. Served on a grilled bun. Fresh Haddock lightly battered & deep fried. Sauteed peppers, onions, mushrooms and broccoli. Lettuce, Tomato, Red Onion, Feta & a side of House Dressing. Grilled Peppers, Onion, Mushroom, Salami and American Cheese. Lettuce, Tomato, Onion, Feta, Dressing. Lettuce, American Cheese and Homemade Sauce. Grilled chicken, peppers, onions, mushrooms, tomato & cheese upon request. Char-grilled sirloin tips, lettuce, tomatoes, onions, feta, and creamy Greek house dressing. Thinly sliced Italian sausage, homemade meatballs & provolone cheese. Topped with our homemade marinara. Grilled Peppers, Onions, Mushrooms, Salami and Cheese. Sliced Pepperoni, topped with Tomato Sauce. Homemade Cutlets with Sauce and Provolone Cheese. Homemade Eggplant topped with Sauce and Provolone Cheese. Homemade real Veal cutlets with Sauce and Provolone Cheese. Homemade Meatballs in a Homemade Marinara, topped with Provolone and grated Romano. Lettuce, tomatoes, onions, hot peppers, pickles, olive oil, seasoning or mayo are available upon request. Fresh mozzarella, basil, tomatoes & balsamic dressing. Premium Deli Meat - Imported, Hot Ham, Genoa Salami, and Mortadella. Topped with Provolone. Ham, mortadella, and American Cheese. Made with all white-meat chicken. Lettuce, tomatoes, onions, cucumbers, carrots, green peppers, pickles, olive oil, and seasonings. Ham, Turkey, Roast Beef, Bacon and American Cheese. HOMEMADE DOUGH - MADE DAILY! Fresh Mozzarella, Fresh Basil, Homemade Sauce. Oil and garlic base sauce, topped with fresh, whole-belly fried clams, oregano and olive oil! Honey BBQ base topped with Chicken Fingers. Breaded Eggplant, Caramelized Onions and Ricotta with a sweet sauce. Pulled Pork, Red Onion, BBQ base. Juicy Homemade Cutlets, Oregano & Fresh Shaven Parmesan Cheese. Sauteed Shrimp and Mozzarella with Creamy Alfredo Sauce. Sauteed Shrimp, Fresh Tomato, No Sauce. Pepperoni, Hamburg, Sausage, Pepper, Onion and Mushrooms. Our special blend of cheeses with a slightly sweeter sauce. Introducing our newest pizza at a favorite price! Fresh Tomato, Basil and Parmesan Cheese (No Sauce). Grilled Chicken, Feta Cheese, Tomato & Onion. Pepper, Onion, Mushroom and Broccoli. Pepperoni, Sausage, Ham, Hamburg and Bacon. Grilled Chicken, Broccoli, Bacon and Onion with Alfredo Sauce. Anthony's Popular Pasta dish turned into a delicious Pizza. An Olive Oil & Garlic Sauce topped with Cheese, Onions, Parmesan, Romano and Oregano. Traditional Tomato Sauce with our Chicken Fingers, spiced up with Buffalo Sauce. Chicken Fingers with Zone Sauce base. 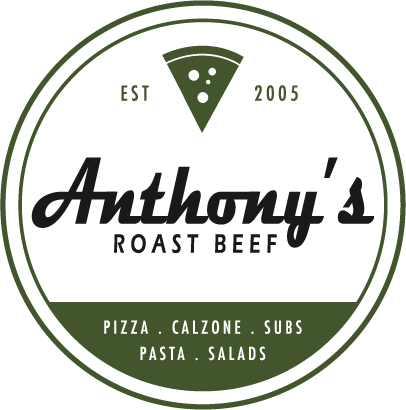 Our famous roast beef combined with our delicious calzone! Served 3 way - BBQ sauce, american cheese and mayo! Breaded Chicken Cutlet with Sauce & Parmesan Cheese. Thinly Sliced Steak and Pastrami. Chicken fingers, bacon, French fries, drizzled with ranch dressing. Chicken fingers tossed in golden BBQ sauce with a side of house dressing. Ziti with grilled chicken breast and tender broccoli with creamy alfredo sauce. Traditional Genoa Salami, hot ham and Mortadella. Grilled Chicken, Tomatoes, Red Onions & Feta. Sauteed Fresh Spinach & Greek Feta. Steamed Peppers, Onions, Mushrooms & Broccoli. Grilled Ham with Mozzarella and Cheddar Cheese. Grilled Steak, Salami, Peppers, Mushrooms & Onions. Grilled Chicken with Steamed Broccoli. Chicken Fingers tossed in a Spicy Buffalo Sauce. Chicken Fingers tossed in Zone Sauce. Thin, flaky crust filled with sweetness! Topped with powdered sugar. Slow-roasted prime beef, cooked medium and sliced thin. Generous portion of tender roast beef served on a grilled buttered onion roll. On a grilled buttered sesame bun. On a grilled buttered bun. Served on white or wheat bread, sesame bun, or onion roll. Fresh mozzarella and basil served on toasted ciabatta bread with balsamic dressing. Tender pork served on a toasted sesame bun with a touch of coleslaw and tangy BBQ sauce. Larger portion of freshly-sliced, top quality, lean pastrami on an onion roll. Made with Albacore white tuna. Served on a grilled buttered sesame bun. Made with sweet crab meat. A triple decker on your choice of white or wheat bread. Served with lettuce, tomato, mayonnaise, bacon, with your choice of French Fries, Onion Rings, Spicy Fries, Salad or Rice. Served with a pickle spear. Also available as a wrap. Choice of white, wheat, or tomato basil wrap. Grilled chicken, mayo, lettuce, tomato and bacon. Fresh mozzarella and basil, tomatoes, romaine lettuce and balsamic dressing. Your choice of grilled or fried shrimp, crisp romaine lettuce, romano cheese, homemade croutons and Caesar dressing. Grilled chicken, crisp romaine lettuce, romano cheese, homemade croutons, and Caesar dressing. Fried chicken fingers, and buffalo sauce. Topped with lettuce, tomato, bleu cheese dressing. Turkey breast, crisp bacon, lettuce, tomatoes, and mayo. Steamed green peppers, feta, mushrooms, onions, and black olives. Grilled steak tips, lettuce, tomatoes, onions, feta, and creamy Greek house dressing. Grilled chicken, lettuce, tomatoes, onions, feta, and creamy Greek house dressing. Homemade Buffalo sauce served with American cheese and lettuce. Tomatoes, feta, red onion, lettuce, olives & house dressing. Crisp romaine lettuce, romano cheese, homemade croutons, and Caesar dressing. Grilled chicken, bacon, lettuce, tomatoes and ranch dressing. Served on a grilled sub roll. Ham, Peppers, Onions and Swiss Cheese. Swiss cheese, cooked onions & peppers and BBQ. Lettuce, red onion, feta and tomato. Fried egg, onion rings, ketchup & mayo. Fresh mozzarella, tomato, lettuce, fresh basil and a touch of balsamic. Made with our signature buffalo zone sauce. Ground sirloin patty and American cheese served on a toasted sesame bun. Grilled shrimp, tender broccoli, with ziti. Served in an alfredo sauce. Shrimp sauteed with garlic, and butter. Tomatoes, broccoli, spinach & olives in a garlic butter sauce. Grilled Chicken breast and tender broccoli with ziti noodles. Choice of ziti or spaghetti with our homemade marinara sauce. Meatballs smothered in homemade marinara sauce and grated romano. Served over ziti or spaghetti. Tender veal fried golden brown, topped with marinara sauce and grated romano. Served over ziti or spaghetti. Fried Eggplant topped with homemade marinara sauce and grated romano. Served over ziti or spaghetti. Lightly breaded and fried chicken cutlet topped with marinara and grated romano. Served over ziti or spaghetti. Sweet Italian sausage topped with homemade marinara sauce and grated romano. Served over ziti or spaghetti. Sheets of tender pasta layered with our homemade marinara sauce and mozzarella. Tender Pork served on a toasted sesame bun with a touch of coleslaw & tangy BBQ sauce. Haddock lightly battered and deep fried. Served with fries, and tartar sauce. Haddock lightly battered & deep fried, served in a buttered & grilled sesame bun, toppings available upon request. Juicy tender grilled chicken with a sweet teriyaki glaze. Char-grilled sirloin steak tips marinated in our homemade sweet honey BBQ. Tender char-grilled steak tips lightly seasoned and marinated in-house. 5 house seasoned chicken wings, tossed in buffalo sauce. 5 house seasoned chicken wings. 5 house seasoned chicken fingers, tossed in buffalo sauce. Slow-roasted prime roast beef cooked medium, sliced thin on a buttered and grilled sesame bun. Freshly sliced pastrami on a buttered and grilled sesame bun. Ground sirloin patty & American cheese on a buttered & grilled sesame bun. Toppings available upon request. 5 strips of chicken breast battered and deep-fried. BBQ, teriyaki, or Sweet Asian available upon request. Freshly fried, or baked (your choice), scallops, shrimp, whole belly clams and haddock. This customer favorite also comes with your choice of two sides. Steak Tips & Baked Shrimp. All rolls are served with lettuce, a side of Cole slaw and your choice of one side. Our Onion Rings are made fresh every day! Deliciously fried with a cream cheese and jalapeno filling! Golden Fried Mac & Cheese. Golden fried Cheesecake! So Sweet! Golden fried broccoli and cheddar bites. Served with house dressing. Available in Teriyaki, Buffalo Zone, Sweet Golden BBQ, BBQ & Sweet Asian Sauce. Topped with red onion, tomato. oregano, drizzled with olive oil and mozzarella. Freshly baked bread sticks topped with garlic butter, Romano, and mozzarella, then baked until golden. Served with marinara. Freshly baked bread sticks topped with melted butter, cinnamon and sugar. Baked until golden, served with vanilla icing.